If you haven't noticed, we read a lot in our little corner of the world. The girls and I are book lovers to the core--and we all read fairly quickly. 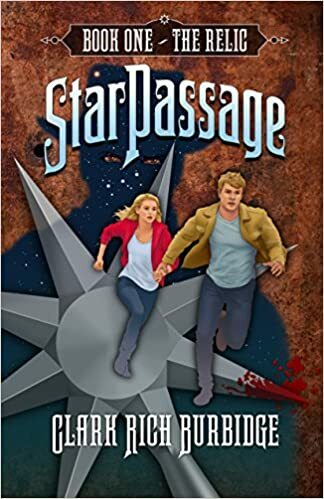 This week, I had the opportunity to read the first two books from the StarPassage series by Clark Rich Burbidge. While these books are intended for upper elementary/middle school aged readers--my reading buddies were too busy with back to school to finish the first book. (When my youngest finishes it--I will add her thoughts to this post!) For today; however, I am excited to share my thoughts on StarPassage Book One: The Relic. What did I think of the first book of this series? Teenagers Tim and Martie are desperate to end their parents' downward spiral. Between their father's PTSD and their mother's depression, their family has reached a breaking point. Then an ancient Christmas ornament reveals its secrets, sending the siblings across the centuries on a search for hope. But Tim and Martie aren't the only ones hunting through time. They're being watched by dark figures-Trackers doomed to haunt history. These Trackers believe the teens' ornament is their key to freedom, and they will do whatever it takes to steal it. What begins as an exciting adventure becomes a deadly race. Can Tim and Martie find the answers they seek before their enemy finds them? Great Blend of Science Fiction, Fantasy and Historical Fiction. My daughters love sci-fi/fantasy novels. They have been hooked from the early days of The Magic Treehouse, Percy Jackson and The Hunger Games. This series opener made me happy, as a mom, on many levels! It added in doses of realistic, historical fiction settings and kept the fantasy/sci-fi realm of interest alive at the same time. Just as the kids learn mythology from Percy Jackson--they have a great opportunity to dig deeper into historical times with StarPassage. The Author Writes Well for the Intended Age Group--but, Parents Can Read Too! It is not always easy to create a series that both the kids and the parents can read without being bored or confused (on either end of the age spectrum.) The author has a great writing style for the middle school aged audience--but, makes the content complex and interesting enough that parents can read as well. Readers will Want to Follow the Series. The book's ending leaves enough to pull readers into the 2nd book of the series (which I began to read last weekend and will be reviewing in a couple of days!) There is enough resolution to satisfyingly end the first book--yet leave some threads dangling for book two! Would I recommend Star Passage Book One: The Relic Book? I think this is a wonderful book to encourage the kids to visit or revisit some history-themed topics. However; readers should be aware that there is a spiritual/faith based element present as well. ( I didn't find this overdone--but, it may be perceived a bit stronger by some.) I felt that there were times when some of the characters seemed to behave a bit "out of character" or act a bit too abruptly--or the scene seemed a bit stretched or forced--but, I think those things would be far more noticeable to some of the parent/adult readers than to upper elementary/middle school readers. I would recommend the book to sci-fi fantasy fans--and to parents seeking to prime a child's interest in history via some tried and true, often enjoyed, fantasy themed content.--and I will add my 11 year old's thoughts once she finishes the book!